We can help you with your Rio de Janeiro and Salvador group travel needs. Managed or unmanaged groups, family reunions, school groups, incentive travel programs and awards, groups of friends, company site inspections, meetings, business trips, wedding parties, research visits, birthdays, church groups, class reunions, anniversaries, wine clubs, team building, convention planning or professional organizations. Discover Brazil can help you create an unforgettable Rio de Janeiro and Salvador Group experience. This is a Sample Brazil Travel Vacation Package we have created for Groups in the past. Arrival in Rio Transfer in Airport / Hotel Brazilian Samba Dinner Show Brazilian Samba Dinner Show Night in Rio is a meeting point and makes the heart beat faster. Visit the “escolas de samba” as they open their dance floors for “rehearsals”(a combination of a party and a pep rally), in preparation for the coming Carnival. Begin with dinner at typical barbecue restaurant for a non-stop feast of Brazilian meats, salads, vegetables and drinks. Full Day City Tour – Corcovado and Sugar Loaf with lunch Corcovado Half Day Tour After a beautiful scenic drive along Copacabana, Ipanema, Leblon beaches and Rodrigo de Freitas Lagoon, passengers arrive at the bottom of the Corcovado hill where they will embark on a comfortable train which will go along the beautiful Mountain, where the statue of Christ, the Redeemer, overlooks Rio in a magnificent panorama. Sugar Loaf Half Day Tour The tour begin with a visit to Downtown with a stop at Metropolitan Cathedral, then we’ll drive to “Praia Vermelha”, to take the two-stage car up to the top of Sugar Loaf (270m), which grants the entrance to Rio’s harbor and Guanabara Bay. The first stage is Morro da Urca with 170m, with a restaurant, amphitheater and helicopter-point. The second stage goes on the Sugar Loaf itself. Free day at the beach Transfer out / Flight to Salvador / Transfer in Bahia By Night Dinner Folkloric Show Bahia By Night Dinner Folkloric Show A night focusing on the wealth of Bahian culture. The presentation begins with the sacred dances of the Candomblé, then puxada de rede in honour of Yemanjá, the goddess of the sea, followed maculelê, an acrobatic stick and sword dance from the cane fields. The highlight of the show is an exhilarating display of capoeira, the stunning martial art/dance of Angolan origin. The show ends with the samba de roda, a spinning, swirling version of this exuberant national dance. Dinner is buffet of international and Bahia cuisine served in the area that was once the warehouse. Half day Historical City Tour with lunch Half day Salvador Panoramic Tour Half day Historical City Tour with lunch You will be picked up at your hotel and begin your half day tour following to the Farol da Barra (the lighthouse), passing by the Santa Maria Fortress and Barra Harbour. From there you go to the upper city through the Corredor da Vitória, Campo Grande and Piedade. Awaiting us in the upper city is the highlight of the tour, the Pelourinho. Pelourinho is considered the most important that exists in the world today bye UNESCO, filled with a rich collection of 17th and 18th century colonial architecture. 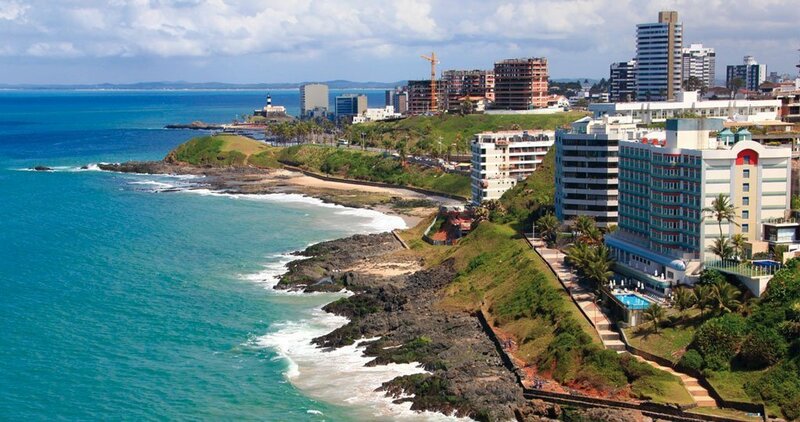 Half day Salvador Panoramic Tour You will be able to know and to appreciate the beauties of our other city, called Cidade Baixa (low city), where the Itapagipe Peninsula stretches out into the sea, providing panoramic views. This first holiday residences district now is a peaceful family district where life moves at a slower pace than the bustling upper city. You will visit the famous Church of Bonfim, place where happen most of the religious manifestations of Bahia. Finally a stop at the Mercado Modelo, a thriving market for local handicrafts, the biggest of Bahia. Full day Island Tour with lunch Full day Island Tour with lunch Visit the islands of the Baia de Todos os Santos on a schooner, stopping off for lunch at the island of Itaparica. The largest and fairest bay along the Brazilian coast, All Saints Bay in the state of Bahia, amazes visitors because of the large number of tropical islands with enchanting beaches and lush vegetation; great historical treasures dot the landscape: churches, forts, beautiful colonial mansions and plantation houses from the times when Brazil was still under Portuguese rule. The bay was once the largest seaport in the southern hemisphere. Please contact us for a Custom Rio and Salvador Package for Your Group.